Incorporating more fiber into your diet is a good way to deal with those problems, and there are some tasty ways to do so. You'll also want to drink plenty of water to help keep it all moving. Based on that set of extremely personal questions, you can probably guess the reasons why you should endeavor to get more fiber in your diet. The biggest reason is that getting the right amount of fiber is going to make you poop like a champion. And who doesn't want to poop like a champion?!? Fiber is going to help you go more regularly, so if you struggle (literally) with constipation, incorporating more of it into your diet will grease the skids, so to say. Speaking of skids! Sticky poop, the kind that leaves skid marks behind in the bowl, can be helped by the introduction of more fiber into your life. Hemorrhoid sufferers are also encouraged to get more fiber, which will allow you to go to the bathroom more easily, thus avoiding the straining that can lead to or exacerbate hemorrhoids. But what do those numbers look like in real terms? Let's translate them into real foodstuffs to make it easier for you to know what to look out for. It's tricky to recommend specific cereals, because people's food preferences are wildly different. What's more helpful than dictating that you eat a bowl of Grape-Nuts every morning is telling you what to look for in a cereal that's going to help with your fiber intake. A good guideline to follow is to check the nutrition information on the box of cereal and opt for something that you like that will give you at least 5-6g of fiber per serving. But! You can do better than that, if you can stand it: there are many cereals that offer upwards of 10g of fiber per serving, which is going to put you much closer to your daily fiber goals. Consumer Reports has a handy chart listing high-fiber cereals that includes easily scannable nutritional information for a variety of cereals including bran flakes and granola. If you have a sweet tooth and cereal isn't enough to satisfy it, these Fiber One bars are legitimately good and have 5g of fiber per serving. Just, uh, be careful not to get into them when a case of the munchies hits. You will live to regret that particular binge. Are you more of a toast-for-breakfast kind of person? The darker breads are the way to go; you'll get about 6g of fiber from two slices of whole-wheat, seven-grain, or dark rye bread. 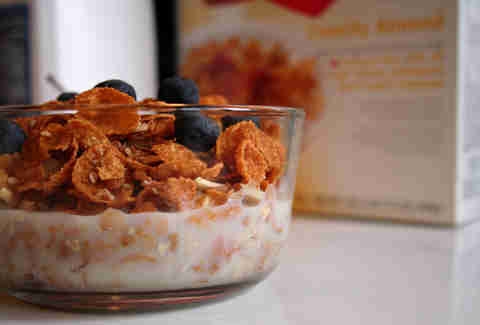 Cereals are a great way to get a lot of fiber in right at the start of the day, but they can be bland. One very smart way to make high-fiber cereal a bit more appealing, and to get an extra dose of fiber in to boot, is to pair the cereal with a serving of a high-fiber fruit. 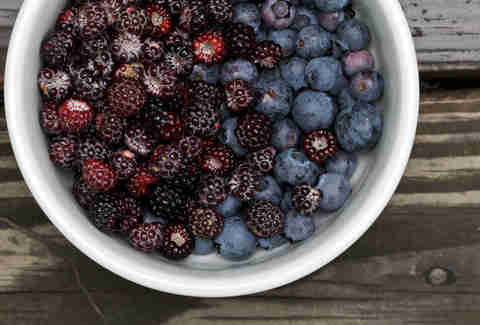 Berries are the best choice (those seeds, you see, are full of fiber) -- a cup of raspberries or blackberries has about 8g of fiber. Bananas (3 per one medium fruit), pears (5-6g per one medium fruit, with skin), and apples (4g per one medium fruit, with skin) are convenient choices because they're portable and also smoothie-friendly. 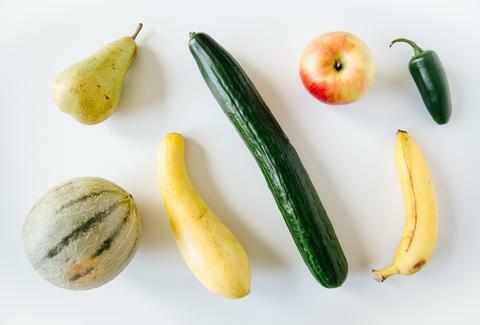 When it comes to high-fiber vegetables, bear three words in mind as you stroll through the produce section: leafy, dark, and crunchy. 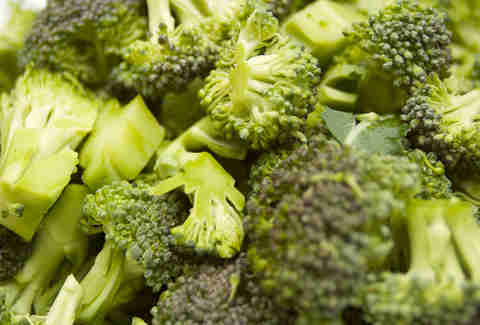 Leafy greens like Swiss chard (4g per cup), collard greens (4g per cup), and spinach (7g per ½ cup), sturdy veggies like broccoli (5g per cup), Brussels sprouts (4g per cup), and artichokes (10g per one medium vegetable), and colorful choices like carrots (2g per one medium vegetable) and beets (4g per cup) are good choices. If you're not a great lover of vegetables, consider going for things that can be snuck into other foods like chilies, stews, and smoothies, greens and carrots being good examples. 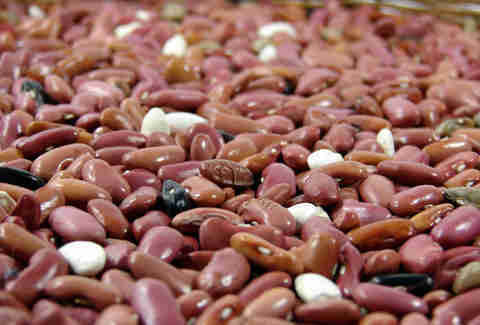 Beans are an excellent source of fiber, but not all beans are created equal. The big guns when it comes to fiber delivery are black beans (19g per cup), kidney beans (19g per cup), pinto beans (19g per cup), and white beans (16g per cup). Check out the Mayo Clinic's chart of high-fiber foods and the Mt. Sinai fiber chart for more options before going forth and eating more fiber. Jolie Kerr is a cleaning expert who gets plenty of fiber. Follow her: @joliekerr.